Research Through Planning is a faculty research grant program at the University of Michigan Taubman College of Architecture and Urban Planning. 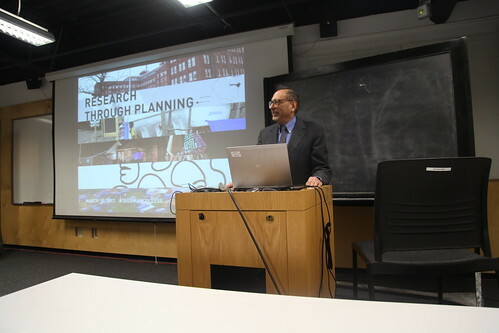 Built on the success of other college programs including Research Through Making and Research on the City, Research Through Planning provides seed funding to advance scholarship toward significant urban research projects. In its second year, four Research Through Planning grants of up to $5,000 were awarded. Thank you to Alan and Cynthia Berkshire for their generous sponsorship of the Research Through Planning grant program as well as their support of previous Research on the City grants. Part an atlas, part a travelogue, part a window into the future, this investigation will trace a visual narrative of the contemporary landscapes of the Narmada River, the histories and stories around its mythical waters and the distinct identities formed during its course through the states of Madhya Pradesh, Maharashtra and Gujarat, in India. The Narmada River travels more than 1,300 kilometers from the Maikala Range toward the Arabian Sea, in the Gulf of Cambay. A critical component of the cultural heritage, livelihood and the formation of regional identities, this sacred river has suffered deep transformations as part of one of the largest infrastructural projects in the country. The Narmada Valley Development Project (NVDP) has long envisioned the transformation of the river into an interstate infrastructural network of water conveyance and energy generation. This research will unfold the social, economic and political structures that have licensed the current state of uncertainty in the future of the river watershed, depicting the plans for implementation by the NVDP and the local processes of resistance. The representation methods will include cartographic studies, photography, video and integrated process-diagrams to render the transformation of the natural and cultural systems associated with the river over time, from the mythical historical landscape to the contemporary shifts in landform, land cover and land use patterns. This project proposes to advance physical planning strategies for cultural and environmental heritage sites. The project will extend a current collaboration by the applicants on an archaeological survey and anticipated excavation project for the ancient Ionian city of Notion, Turkey, led by co-applicant Ratté. Specifically, this research will explore how to plan “living archaeological parks” as integrated developments that break down boundaries between preservation site and surrounding community, and that are planned in ways to be supportive of and beneficial to both communities and regional landscape ecologies. In this project, co-dependent factors that will need to be addressed in addition to heritage conservation, include maintaining the ecology of native landscapes on the site, the rehabilitation of an environmentally degraded river, and the potential of sea level rise at beachfront developments. The primary research methods will include combinatory site analysis mappings, fieldwork and community engagement, and scenario planning. The outcomes of the research will be a series of cartographic depictions of the site, as well as a series of scenarios for the sustainable planning of the archaeological, recreational, agricultural, and urbanized lands that comprise the site. The work will be shared with local community members and authorities the following year. What Can Food Do for the City? Urban food systems advocates typically ask, “What can the city do for food?” Our proposal turns the question around, asking “What can food do for the city?” In doing so, we aim to equip food advocates with tools that show how food initiatives are not a cost, but an investment that yields a significant return to the city and its residents in the form of public savings, job creation and improved quality of life. Our proposal comes at an important political moment – when urban planners may be most receptive to considering how they can institutionalize food as a core part of their function, just as alternative food movement actors have developed numerous options for reintegrating food into the fabric of city life. To unite these two trends, however, we argue that food advocates need a better framing, to help them turn the question they ask of city governments from an adversarial one, to one that is enabling. Phase One of this project intends to develop and ground-truth a framework to describe the multiple ways food can be leveraged to build more inclusive, green, and economically viable cities. Addis Ababa, Ethiopia is one of the fastest growing cities in Africa. However, the city’s population growth has not been matched with the development of infrastructure systems. With increasing prosperity, the city government recognizes the need to create water systems that will meet the potable, wastewater, and stormwater needs of the people. The rivers are important water sources in the city but during the June, July, and August wet season, heavy rains wash pollutants and garbage directly into the rivers and flash flooding displaces many of the city’s poorest residents. This is the third year of a collaborative research project between the University of Michigan and Addis Ababa University that focuses on stormwater management. Each year, several students from the University of Michigan travel with a faculty member to Addis Ababa so they can work collaboratively with Ethiopian students and faculty. During these visits, graduate students are confronted with the challenges of making environmental improvements in a low-resource city. Equally important to learning about urban infrastructure and water pollution is the opportunity for students to meet capable colleagues and see how they can work collaboratively on urban planning efforts to improve conditions. This proposal seeks funding for two University of Michigan Urban Planning students to travel to Addis Ababa in June 2017.